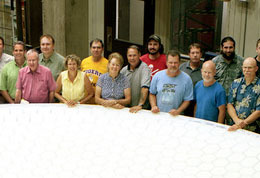 How do you create the world's largest monolithic optical mirror? As the saying goes, “One bite at a time.” It is a unique process in that it is entirely linear. No aspect of the process can be done in parallel since each step is entirely dependent upon the preceding step. In theory, it is a linear slope from 0x0 to 100x100. Assuming, of course, that there are no deviations from the slope caused by inevitable and unpredictable variables such as mistakes, mishaps, or just plain accidents. Rarely do the “actual” data progress points fall above the line, which would indicate being ahead of schedule. In those rare instances where that may happen, it is almost always associated with a corresponding drop below the line. If ever there were a true “end justifying the means,” fabricating a giant mirror is it. Although the process actually begins with the acquisition of materials, I will assume, for this model, that all materials are in house, and the manufacturing process is ready to begin. There are three distinct stages that the mirror must pass through before the long trek to its final home on some far-off mountain top. First, the raw glass must be cast in a large furnace. Next, the mirror must pass through the grinding, polishing, and testing operation. Only then does it travel into the integration phase where the finished mirror is mated to the telescope’s cell. There, it will reside for many decades to come. There are some properties of liquids that may be obvious to some, but not to all (myself included). First, a liquid rotated in a container results in a parabolic surface shape. The speed at which the liquid is rotated will determine the final shape. This is a critical aspect of the process because the desired focal ratio of the mirror surface must be established at this stage. Any variation may require extreme processes later in the operation to achieve the desired parabolic curve. So, how does this happen? An appropriate furnace is required. One that will rotate at the required speed, that will operate at over 1,200 degree F, contain roughly twenty tons of molten glass, and operate flawlessly for months. Failure of any of these parameters will result in a multi-million-dollar loss. The power required to operate this furnace must employ a number of temporary generators to supply power, since the municipal power grid is not sufficient. I must digress to explain exactly how the glass gets into the furnace and what controls are utilized to provide the confidence that the process will not fail. The glass arrives at the casting area in large wooden crates. Surprisingly, the glass arrives in randomly sized “broken” pieces only a few pounds each. Each step in the casting process is executed by a field of technicians. Their expertise begins as they, using cross-polarized light, inspect each and every piece of optical glass looking for internal debris and stresses of any size. 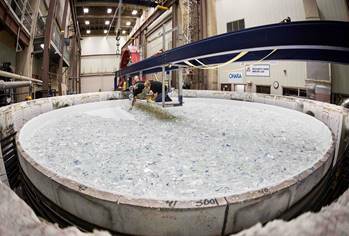 Since these twenty tons of glass will be melted into a mirror blank, the debris will have no optical effect, as it would in a lens, but the debris may introduce surface flaws later during the grinding and polishing phase. These same technicians follow the glass as it is being placed into the furnace. The mirror is cast face up, so any debris will tend to settle to the back plate of the mirror. It must be noted that, just as a beached whale will be crushed under its own weight, a solid piece of glass three feet thick and over eight meters in diameter could not support its own weight. 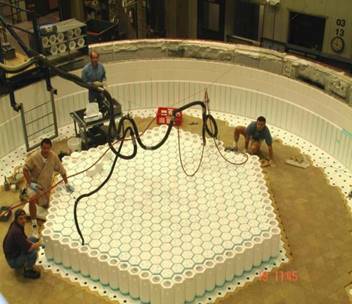 The solution is to cast a hollow core structure by placing blocks of material, cut into tall, hexagonal shapes (see photo), that displace glass in the furnace. How do we do that? Like almost everything else, simple. We find a material that can withstand the temperature of molten glass while maintaining its shape. Oh, and when we are done using it, we must be able to remove the material with high pressure water sprayers leaving a hollow core, so it also has to be water soluble. Once these core pieces are in place, these very same technicians place each small block of glass carefully on top of the cores one at a time until all twenty tons of glass are in place. The furnace is not a monolithic structure. Rather, it is built piece by piece to form a four-foot high circular furnace with a corresponding inner wall to support the molten glass. Why is this notable? 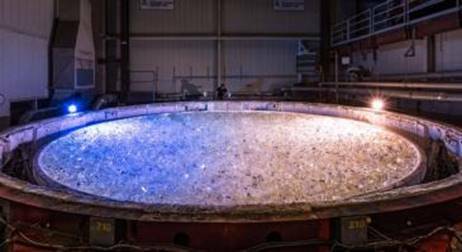 Because during the casting of one of the mirrors, the inner wall failed and hundreds of pounds of molten glass leaked out of the inner wall! Oops, that data point fell below the line! There are special cameras that continually monitor what is happening inside the furnace for process control. One of our customers actually monitored the casting operation via those cameras from hundreds of miles away. Ever had somebody looking over your shoulder while you are working? Melting twenty tons of glass does not happen quickly; about three months depending on mirror size. Since the Casting area is directly below the east grandstands of the University of Arizona football stadium, the actual casting process must be done in the off-season. The temporary power generators are in semi-tractor trailers located in the parking lot and on the street. This poses a significant parking problem. They won't even let employees park in their own spaces. During those times, we are required to park off-campus. Personally, I tossed a bicycle in the back of my truck and rode it to the Lab. Controlling how fast the molten glass cools is at least as important as how fast it can be melted. The process of cooling the glass is called annealing, and it requires following a strict cool-down protocol. Cooling too quickly will induce stresses in the mirror. Any stresses present in the cooled mirror will ultimately relieve themselves to the detriment, or even destruction of the mirror. The annealing procedure actually takes longer than melting the glass; upwards of three to four months. I'd hate to see the electric bill at the end of the casting cycle. Once the mirror has cooled sufficiently, the top and sidewalls of the furnace are removed. A steel spider-like lifting-fixture assembly is lowered by crane until an array of rubber pads are just above the surface of the mirror. A strong silicone adhesive is liberally applied, and the spider is then lowered a bit more until the pads are in full contact with the adhesive. Additional weight is applied via sand bags at each pad site to ensure equal contact, and are left in place until the adhesive has completely set. At this point, the mirror is lifted and lowered and secured into a large metal ring structure which will be the mirror's home for the balance of the casting process. Once the mirror is secured in the metal ring structure, it is rotated so the mirror is vertical with the back plate fully exposed. There are over four hundred core holes facing outward that are still filled with core material that must be removed. (The core material resembles Styrofoam.) The technicians construct a series of scaffolds next to the exposed back plate, and they enclose the entire area with transparent vinyl sheeting. Donning wet suits with oxygen face plates, they resemble outer space creatures. From strategic positions on the scaffold, they begin to use high pressure water wands to wash out each core. Given the number of cores, this process takes about a week. Once the washout procedure is complete, the vinyl tent and scaffolding are removed, and the mirror is rotated into a horizontal configuration with the back plate facing up. All of the cores have now been cleaned out. 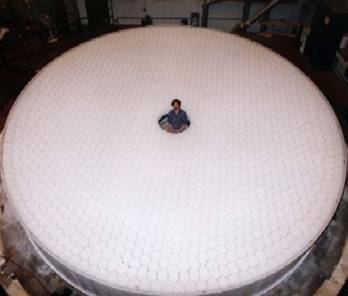 The mirror blank is transferred in a steel cell for further processing. The mirror is moved via an airlift tractor that is driven by one of us into the Polishing area. Driving the “aircart” is a real experience. The combination of the mirror, the polishing cell, and aircart weighs well in excess of fifty tons. 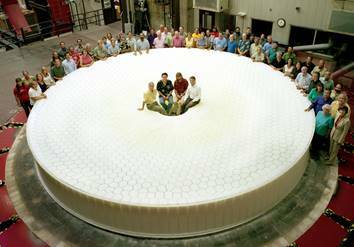 Despite that tremendous weight, the entire assembly floats on a cushion of air with one little steerable tractor being driven by one person. Gee, I wonder if anyone ever crashes into anything? Yep, you haven't moved a mirror until you run over something, crushed something, or banged into something. It's not all fun and games at this point. The clearances between the mirror and immovable objects is measured in inches. Getting between that sliding behemoth and the Test Tower pillars can be fatal. Ground guides surround the mirror as it moves, although no one can be heard above the roar of the aircart. You must keep your head on a swivel, watching clearances and ground guides for waving arms. There are no brakes. In an emergency, all you can do is cut the air to the cart. In that case, the monster will still move about a foot while it settles to the floor. The floor, by the way is polished concrete. If you've ever been around military aircraft, you know what a “FOD” (foreign objects and debris) walk-down is. Everyone forms a line and walks down the area picking up the tiniest pieces. Left alone, they can spell disaster for the move. There are a number of processing steps that I have not covered, but are all critical to the successful completion of the casting function. However, for all intents and purposes, casting is done with the mirror at this point, and my area (Polishing Lab) takes over. 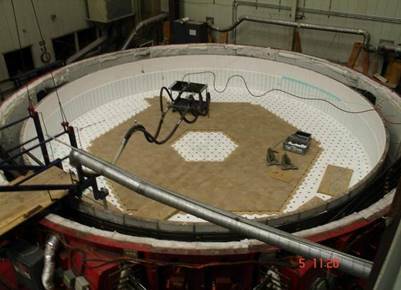 These last pictures are of the casting of the LSST primary and tertiary mirrors. How can one mirror become two? I will cover that in my next offering which will address the grinding and polishing of the front surface. Yep, that's my wife and me in the center of the cropped picture. Part III will discuss the generation, grinding, and polishing of the mirror surface. Fascinating stuff - I'm looking forward to part III. Exciting & interesting read - thanks Patrick! 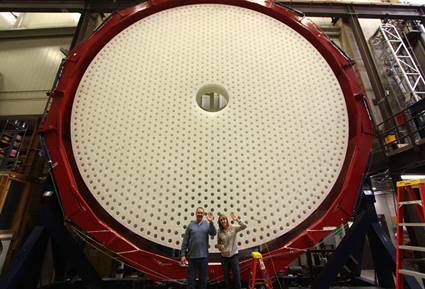 When we took the Mirror Lab tour this February, we learned so much--but your article is adding many interesting details to what we saw there. Thanks so much...now eagerly awaiting Part III! Wow! I had no idea how large mirrors were cast. That must cost a fortune. About $20 million per mirror. Awesome, eager to read the rest. Your website is awesome. Now I think I know what I want to do with mine! You have a great collection of telescopes for every purpose! I'm not familiar with the iOptron mount, but I used the Atlas EQ-G for years and loved it. I just got a Celestron CGX that is even better! The alignment/calibration process and the polar alignment (even is you can't see Polaris) is super. If you ever decide to change mounts I would recommend the CGX. Thanks for your comment. I am already working on the next article. I had no idea that I would get the response I'm getting. Very interesting reading! That you 'lifted yourself up by your own bootstraps', and show how knowledge is no substitute for passion, is very inspiring and would resonate with many. Compile a little more background info and turn this into a book, please!! Thanks friend. I appreciate your suggestion, but I don't think I have the patience to write a book. But then, I don't have a lot of other things to do these days. Who knows? $20 million? It surprises me that there aren't a bunch of telescopes in the $50-million range (total) for those who could afford it. Of course, I suffer from astronomy tunnel vision. I know what I would do with 50 mil. With a bil, pay off a region to lower light pollution to zero. But that's moving off-topic.